Stewart & Stevenson Tactical Vehicle Systems, LP (TVS) designs, manufactures and supports the Family of Medium Tactical Vehicles (FMTV) for the US Army and other customers worldwide. Stewart & Stevenson has recently developed the Low Signature Armored Cab (LSAC), which adds ballistic and mine blast protection for the crew in a purpose built cab that can be interchanged with a standard FMTV cab in 8 hours. The Low Signature Armored Cab provides survivability for the occupants during direct small arms fire attack, artillery airburst, land mine strike, or attack from Improvised Explosive Devices (IED). As of December 2004 only 10 percent of the 4,814 medium-weight transport trucks in Iraq had armor, while about 15 percent of the 4,314 heavy transport vehicles in Iraq had armor protection. On 13 October 2004 the lack of armored trucks led 18 reservists in Iraq to refuse to deliver fuel. The soldiers were told to deliver fuel from the Tallil military air base near Al-Nasiriyah to Taji, outside Baghdad. But the soldiers say the mission was flawed and too dangerous and that they would have been easy prey for insurgents who frequently attack along the 360-kilometer supply route. On 09 December 2004 the lack of armored trucks led Specialist Thomas Wilson, one of several thousand soldiers headed for battle, to as Secretary Rumsfeld "Why do we soldiers have to dig through local landfills for pieces of scrap metal and compromised ballistic glass to up-arm (arm) our vehicles and why don't we have those resources readily available to us?" The question drew cheers and applause from fellow soldiers and criticism, including from lawmakers on Capitol Hill, over the way Secretary Rumsfeld responded. "It's a matter of production and capability of doing it. As you know, you go to war with the army you have, not the army you might want or wish to have at a later time." The focus of this effort for FMTV is soldier survivability. FMTV has a well- earned reputation for being one of the US Army's safest vehicles to operate. The new FMTV armored cab adds crew protection as a new element of soldier safety. With a technologically advanced design, LSAC will provide an unprecedented level of armored protection without reduction to vehicle performance or transportability. Air-conditioned and equipped for C-130 aircraft transport, its light weight is attributable to the sophisticated vehicle system optimization only available from the OEM. This allows the vehicle to retain its world-class mobility characteristics. Two options available for the cab allow it to be fully integrated on the FMTV production line or stuffed and delivered directly to the operating theatre where it can be easily installed in the field. Armor kit-equipped tactical truck platforms, including the FMTV, continue to be rapidly fielded to Soldiers in Iraq and Afghanistan. 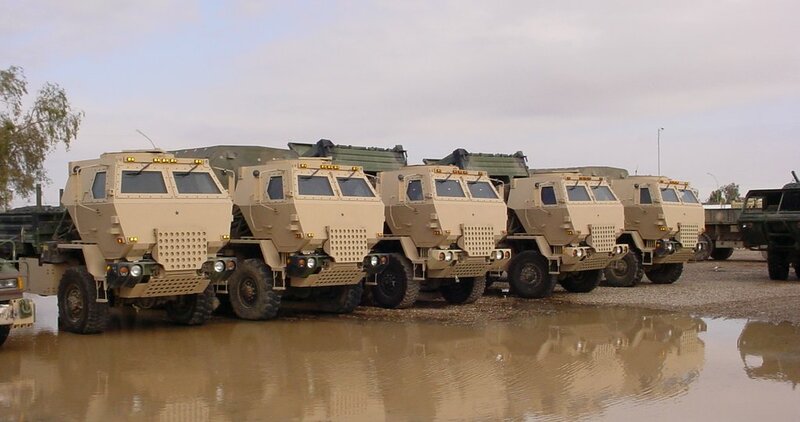 On 09 July 2004 Stewart & Stevenson Tactical Vehicle Systems, Sealy, Texas, was awarded an $11,604,821 increment as part of a $23,256,154 firm-fixed-price contract [W56HZV-04-C-0591] for 385 low signature armor cabs for the Family of Medium Tactical Vehicles. Work will be performed in Sealy, Texas, and is expected to be completed by July 1, 2005. Contract funds will not expire at the end of the current fiscal year. This was a sole source contract initiated on June 17, 2004. The US Army Tank-Automotive and Armaments Command, Warren, Mich., is the contracting activity. By 24 November 2004 the total value of the contract was estimated at $68,130,890.77. Applique Kits - A separate armor applique kit may be developed and fielded that attaches to the cab applique appurtenances and the retrofit cab applique appurtenances. When installed, this kit shall provide a minimum of ARL class 3 protection when installed on the cabs opaque armor with an angle of attack normal to the attack side surface of the appliqu. The firing port shall also have this level of protection, but Appliqu is not required to cover this area in order to get this protection. Must be able to work with other current and future kits. Effectivity and scope to be negotiated between Contractor and Government. Retrofit Armor Applique Appurtenance Kit - A separate armor applique appurtenance kit may be developed and fielded for those cabs built prior to cab #100 (actual effectivity to be determined). Kit shall be field retrofittable by contractor support personnel (remote site installation). When installed, the kit shall allow the installation of armor applique kits). Must be able to work with other current and future kits described within this instrument. Effectivity and scope to be negotiated between Contractor and Government. External Stowage. A separate kit may be developed that allows the crew to secure their crew/section equipment. The stowage provisions shall not interfere with the cabs normal operation, with or with out appliqu installed. If the stowage provisions are external, they shall provide a method to secure the equipment so as to prevent easy theft from off the vehicle. Must be able to work with other current and future kits. Effectivity and scope to be negotiated between Contractor and Government. Solution must be retrofitable. Opening Windows. The Government may develop/field/produce the capability for cab side windows to open and close, and allow the FMTV soldiers to fire aimed rifle fire (M249, M16 series rifle with optics, M4 series carbine with optics) from inside the cab while seated (MINOR adjustments allowable in soldiers position in order to properly engage targets). Must allow the soldiers to acquire and engage targets in azimuth + 60o normal to the side of the cab; and + 30o in elevation parallel to _ _ the ground, and from the center of the opening. Opening must work when the armor appliqu kit is installed. If the window can open, the firing port is no longer necessary. Transparent armor on the window must provide the same of better ballistic protection. Must also seal against elements to the same degree as the door seal on the doors. If a powered solution is used, must have a manual back up for opening and closing that a 95th percentile male soldier can perform with some difficulty. Must be able to work with other current and future kits. Effectivity and scope to be negotiated between Contractor and Government. Solution must be retrofitable. Drivers Vision Enhancement (DVE). The Government may develop and field a kit that adapts the Drivers Vision Enhancement into the LSAC that allows the crew to utilize the DVE. Must be able to work with other current and future kits described within this instrument. Effectivity and scope to be negotiated between Contractor and Government. Battle Damage Assessment and Repair (BDAR) Kit. The Government may develop and field a BDAR Kit that allows the unit to repair the base armor of the LSAC to provide the same or equal protection provided by the undamaged section. When armor applique kit is developed and fielded, the kit may or may not need to be updated to provided the same level or protection that the base armor applique kit and cab armor provide in the damaged area. Effectivity and scope to be negotiated between Contractor and Government. Dimensions International Inc., Alexandria, Va., was awarded on Nov. 8, 2004, a delivery order amount of $12,164,983 as part of a $12,164,983 time and materials contract for Armor Installation for the Medium Tactical Vehicles. Work will be performed at Iraq, and is expected to be completed by June 8, 2005. Contract funds will not expire at the end of the current fiscal year. There were six bids solicited on Oct. 15, 2004, and two bids were received. The U.S. Army Tank-Automotive and Armaments Command, Warren, Mich., is the contracting activity (DAAE07-98-D-T061). Under the 08 November 2004 task order DAAE07-98-D-T061/0064 obtained Dimensions International, Inc. $12,164,983.38 contractor services to install Add-on Armor (AoA) Crew Protection Kits (CPK) on Heavy Equipment Transporters (HET), M915 series of trucks and Family of Medium Tactical Wheeled Vehicles (FMTV), to include Air Conditioning (A/C) kits on HET vehicles, a Low Signature Armored Cab (LSAC) for FMTV. Period of performance is seven months from date of task order award, with six (6) months in theater and one (1) six (6) month option for OCONUS deployment. The Government provided facilities are located at Balad, Iraq.. Government estimates that 25 FMTV, 15 HET and 12 M915 CPK can be installed per week in Balad, Iraq. Dimensions International, Inc. [DI] is an international information technology company specializing in information integration, logistics management and air space management support. Providing global solutions for the acquisition, management and transformation of data into information, DI has successfully designed, developed and implemented a full spectrum of engineering solutions within the FAA, Departments of Defense, various civil agencies and the commercial sector since 1985. With respect to the Family of Medium Tactical Vehicles, the Army has worked with both of the companies that provide the kits as well as the integrated cab, to begin to accelerate that particular capability and production level. The plan as of December 2004 was to accelerate the delivery of those systems into theater by about 11 months. When the requirement came in October, there were some of these trucks that the Army did not have a design for. They actually had to go build that design and manufacture it. Some of the trucks and the designs that have been put in place are very sophisticated.